Hi! This scrappy apron is made entirely from scraps. This makes it unique, one of a kind, and special in that there are fewer scraps in the landfill taking up space. This apron has two handy hidden side pockets! Scrappy aprons are each one of a kind so if you like it get it, or you can wait for the next one I make! Dottie’s Diner aprons are extra special and sweet; with full circle skirts that swoosh when you walk, extra-long waist ties, and premium fabrics and trims. Not only can you expect the best in quality from my aprons, but customer service is very important to me. If you’re not happy, I’m not happy, I guarantee that. 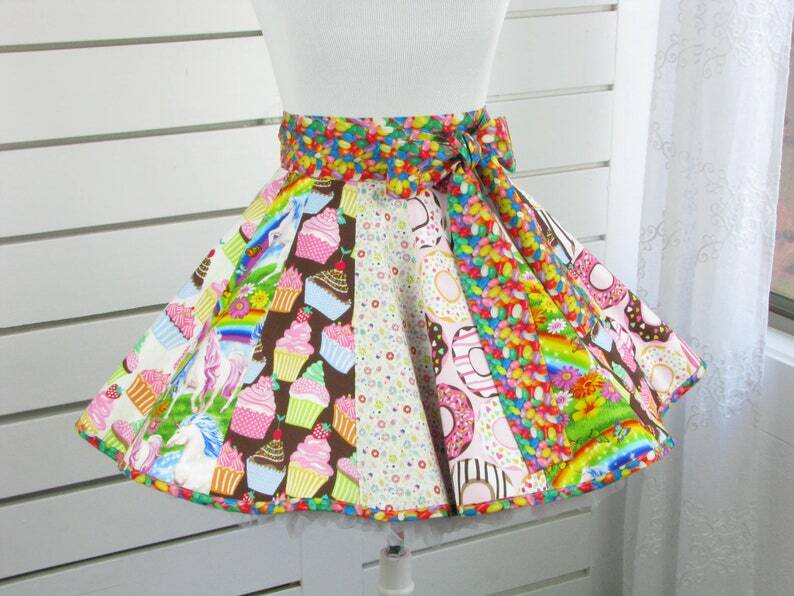 HIPS: Because of the circle skirt, the apron will fit any hip size. WAIST TIES: Are really long - enough to wrap around to the front and tie in a bow if you want. Thanks for stopping in, please come again any time!